ARC is excited to offer pneumatic tires. Developed in house with over 800 hours of wind tunnel testing over the last two years, Auto Research Center is now offering their experience and research to help provide an additional dimension to wind tunnel facilities and racing teams. The pneumatic tires allow for a realistic contact patch and sidewall shape when moving through the large camber curves seen in motorsports. While production car pneumatic tires have been developed to mimic road car tire sidewall deflection. In addition the tires are able to yaw at angles up to 9 degrees. The tire shape is an accurate representation of the tire profile used in NASCAR, Formula 1 or production cars. As an example, for NASCAR testing, the wheel used is the AERO 15 x 9.5 and includes dummy wheel nuts and studs. Each tire is corner specific, with different widths and conicity for maximum shape accuracy. Each tire used is selected from stock, based upon the desired loaded radius. For Formula 1 and sportscar racing teams or for production car testing, each tire can be developed to fit a specific rim design, including varying widths, diameters, tread, etc. as requested by the customer. 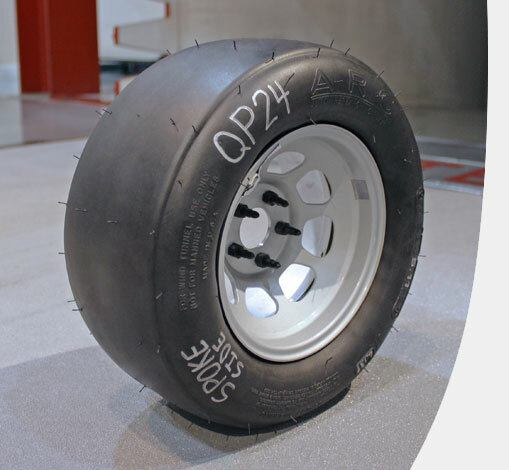 Customers using ARC’s Pneumatic Tires have found a greater understanding on the effect of tire deflection on the rest of the vehicle, as well as increased correlation between track results and the ARC Wind Tunnel. Now ARC Pneumatic Tires are available to you! Auto Research Center now offers Pneumatic Tires to be branded by your own commercially available testing facility. Being able to offer your clients “your own” Pneumatic Tires will set you apart from your competition. Auto Research Center offers Pneumatic Tires that include existing diameters as well as custom diameters. Tires with existing diameters can be developed within three to four months. For custom diameter development, they can be made within six to seven months. Reach out to the Auto Research Center to learn more about this exciting opportunity! Auto Research Center is ready to deliver. Call 317.291.8600 today or email by pneumatics@arcindy.com for a Free, No Obligation Quote.